Yealink One-stop videoconferencing solution works perfectly in the cloud or on-premise and is designed to end the video conferencing dilemma for SMEs. 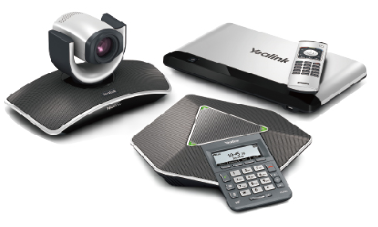 Yealink One-stop videoconferencing is tailored to small business! Based on the concept of Easy Collaboration, Yealink’s solutions have been developed to end the video conferencing dilemma for SMEs, which frequently confront poor network infrastructure, limited IT resources and expensive licensing and maintenance fees. Combining high-quality, ease-of-use and cost effectiveness, Yealink’s solutions enables SME users to connect and collaborate more effectively with convenience, flexibility and ease. Yealink’s solution covers five main usage scenarios. The VC400 system is designed for head offices while the VC120 endpoint is geared for middle-sized meeting rooms of branch offices. The new all-in-one endpoint VC110 is tailored for small meeting rooms and the video phone T49G is ideal for desktop video. Yealink’s support for PC SoftClient and Mobile Video Conferencing satisfies mobility and flexibility needs. Yealink products support 1080p HD video and HD voice across multiple sites, creating a virtual face-to-face experience. The user-friendly interface and intuitive set up boasts 5 minutes from unboxing to uptime. Support for the H.264 High Profile enable high-quality video at low bandwidth (1080P from 1Mb, 720P from 512Kb). This eliminates the need to upgrade the network and reduces costs for SMEs. 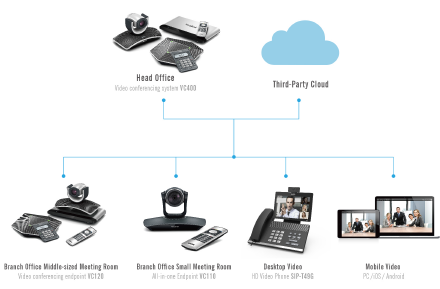 Yealink’s VC Series works well with cloud-based services as well as videoconference systems and MCUs from multiple providers, helping SMEs to avoid compatibility and interoperability issues. Yealink charges no additional licensing fees for 1080P HD video, dual-screen support, recording, content sharing or software updates, enabling SME users to enjoy the best possible videoconferencing experience within a limited budget. Yealink’s solutions extend videoconferencing from the conference room to the desktop to mobile users on smartphones and tablets. Yealink enables business people to enjoy the video conferencing experience at anytime, anywhere and on any devices.